If you have a big appetite, then the state of Iowa is where you’ll want to go. Spread out between the cornfields, rivers and major metropolitans in Iowa, there is more than one restaurant that can feed you well. Whether it’s an arm-straining burger you're after, or a food challenge to test your hunger, you’ll find it in Iowa, and specifically, you’ll find something to love at any of these nine best places for BIG food in Iowa. Featuring ribs, wings and a variety of smoked meats, plus weekly specials, Jethro's BBQ of Des Moines is where you go to kick your appetite to the curb. Not only are the portions plentiful to begin with at Jethro’s, but with the Adam Emmenecker sandwich challenge on the menu, you can really get your fill. Complete with a pork tenderloin, Buffalo chicken tenders, fried cheese cubes, Applewood smoked bacon and a cheeseburger, good luck completing the Adam Emmenecker Challenge is less than the allotted 15 minutes. Home to bike night in Waterloo, Screaming Eagles American Bar is a proud Minnesota Vikings fan hangout spot, and provides an extensive food and beverage menu to choose from. For those visiting Screaming Eagles American Bar with an appetite for big food, the in-house 28,890 challenge is right for you. Finish three burgers, an order of fries, a half-pound of onion rings and a side salad in under 45 minutes, and your meal is free at the Screaming Eagles American Bar and Grill. Established in 2011, Big Ed’s Firehouse is a family-friendly restaurant run by Big Ed, a retired member of the New Hampton Fire Department. At Big Ed’s, patrons can choose between plenty of big meals, including Big Ed’s burgers, smoked pork loin, and sirloin steaks. With any visit to Big Ed’s, some house-sauce hot wings are also a must, and while you are there with an appetite, be sure to inquire about the rotating wing challenges happening throughout the year. An Ames tradition for nearly 50 years, Hickory Park is famous for feeding the entire family. With over 100 menu items to choose from, including smoked meats, one-pound burgers and dinner platters, Hickory Park has something that everyone in the family can enjoy. The only thing bigger than the reputation Hickory Park has garnished for quality meals, is the portions they serve them with at this family friendly establishment of Ames. Big beef entrees and the state of Iowa should nearly be synonymous, and at Iowa Beef Steakhouse in Des Moines you can see the connection for yourself. Featuring several different large slabs of mouth-watering steaks, Iowa Beef Steakhouse also offers hearty servings of pork chops, chicken, ribs and more. Be sure to come with an appetite or leave with a doggy bag at Iowa Beef Steakhouse, and you won’t be disappointed in the selection. Serving big portions with flavor, Big’s BBQ Brew Pub of Mount Vernon is the perfect place to go for an excellent meal and something to wash it down with. You can enjoy smoked ribs, pulled pork, and all kinds of family platters. Big’s BBQ Pairs everything nicely with a large selectin of craft beers. Delivering the ambiance of a 1950s/1960s diner, including a colorful cast of servers to take your order, Max’s Highway Diner comes complete with classic diner items including burgers, malts and fresh-cut French fries. 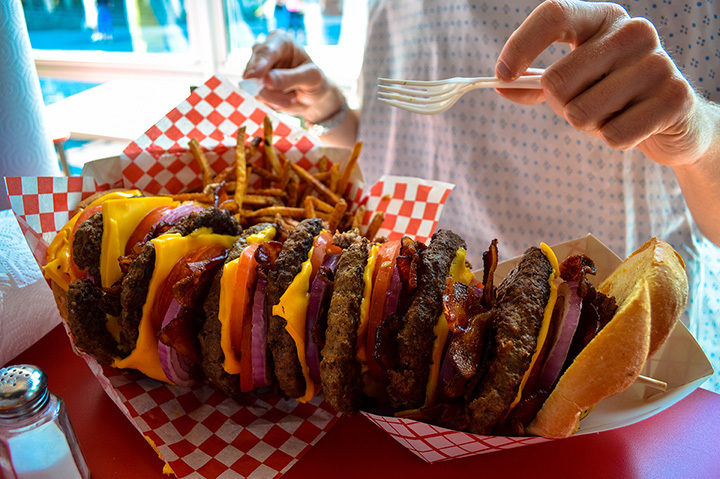 For a real appetite-contesting challenge, the Big Max Challenge at Max’s Highway Diner offers a four-pound hamburger with all the fixings served on a Kaiser bun. Serving as one of the best local grocery stores in Iowa, B&B Grocery has grown a long reputation for stocked shelves, friendly service and one of the best meat and deli's in town. As part of the meat counter selection at B&B Grocery, patrons can opt for any number of award-winning sandwiches, including Dad’s Killer Sandwich, which is stacked Dagwood high with meats, cheeses, lettuce, pickles and tomatoes. For at true taste of a big Iowa breakfast, lunch or dinner, the Machine Shed serves their portions big and fresh out of the oven. Whether you opt for a cinnamon roll the size of your plate, a tenderloin that will tone your muscles as you lift it from the table or sirloin steaks that will require some leftovers, you’ll never go hungry when you visit the Machine Shed. Johnny and I are splitting this.